Wind direction and velocity variations are the primary effects requiring corrections of the flightpath during ground reference maneuvers. Unlike an automobile, but similar to a boat or ship, wind directly influences the path that the airplane travels in reference to the ground. Whenever the airplane is in flight, the movement of the air directly affects the actual ground track of the airplane. For example, an airplane is traveling at 90 knots (90 nautical miles per hour) and the wind is blowing from right to left at 10 knots. The airplane continues forward at 90 knots but also travels left 10 nautical miles for every hour of flight time. If the airplane, in this example doubles its speed to 180 knots, it still drifts laterally to the left 10 nautical miles every hour. The airplane travels within an often moving body of air, so traveling to a point on the surface requires compensation for the movement of the air mass. The lower the maneuvering altitude, the faster the airplane appears to travel in relation to the ground. Drift should be easily recognizable from both sides of the airplane. The altitude should provide obstruction clearance of no less than 500 feet vertically above the obstruction and 2,000 feet horizontally. In case of an engine failure, the pilot must plan, consider, and be alert for forced landing areas while understanding that the lower the airplane’s altitude, the less time there is to configure the airplane for an emergency landing and the shorter the glide distance. Any specific altitude required by test standards. 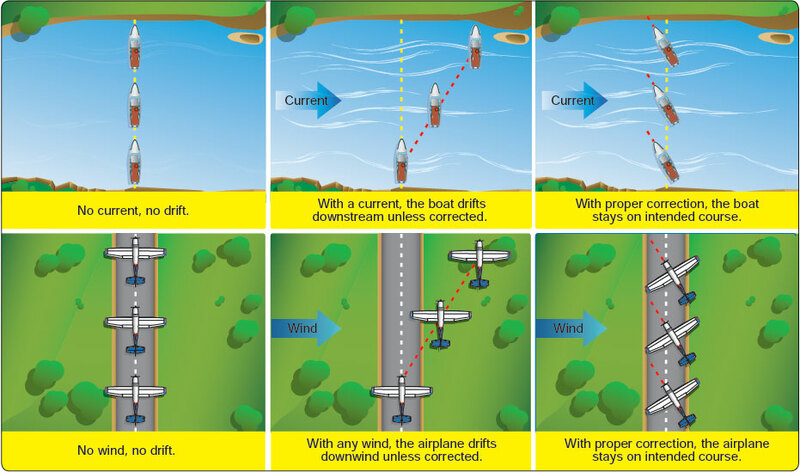 When flying straight and level and following a selected straight-line direct ground track, the preferred method of correcting for wind drift is to angle the airplane sufficiently into the wind to cancel the effect of the sideways drift caused by the wind. The wind’s speed, the angle between the wind direction and the airplane’s longitudinal axis, and the airspeed of the airplane determines the required wind correction angle. For example, an airplane with an airspeed of 100 knots, a 20 knot wind at 90° to the airplane’s longitudinal axis, and a 12° angle into the wind is required to cancel the airplane’s drift. If the wind in the above example is only 10 knots, the wind correction angle required to cancel the drift is six degrees. When the drift has been neutralized by heading the airplane into the wind, the airplane will fly the direct straight ground track. As soon as an airplane lifts off the surface and levels the wings, if there is any crosswind, the airplane will begin tracking sideways with the wind. Any wind not directly on the nose or tail of the airplane will drift the airplane sideways at a speed up to the speed of the wind. A wind that is directly to the right or the left (at a 90° angle) drifts the airplane sideways at the speed of the wind; when the wind is halfway between the side and the nose of the airplane (at a 45° angle), it drifts the airplane sideways at just over 70 percent of the speed of the wind. It should be understood that pilots do not calculate the required drift correction angles for ground reference maneuvers; they merely use the references and adjust the airplane’s relationship to those references to cancel any drift. The groundspeed of the airplane is also affected by the wind. As the wind direction becomes parallel to the airplane’s longitudinal axis, the magnitude of the wind’s effect on the groundspeed is greater; as the wind becomes perpendicular to the longitudinal axis, the magnitude of the wind’s effect on the groundspeed is less. In general, When the wind is blowing straight into the nose of the airplane, the groundspeed will be less than the airspeed. When the wind is blowing from directly behind the airplane, the groundspeed will be faster than the airspeed. In other words, when the airplane is headed upwind, the groundspeed is decreased; when headed downwind, the groundspeed is increased.